And what are those male Black-throated Greens singing about? Males of nearly all the songbirds are the true crooners and sing either to attract a mate, or to proclaim their territory. In the case of these warblers, the males have a different song for each. A sweeter “trees trees murmuring trees” to enchant the ladies, and a terse accented song of “zee zee zee zo zee” to ward off interloping males. The urge to sing is in fact so strong that rather than being quiet altogether, males whisper the latter song as they approach the nest. 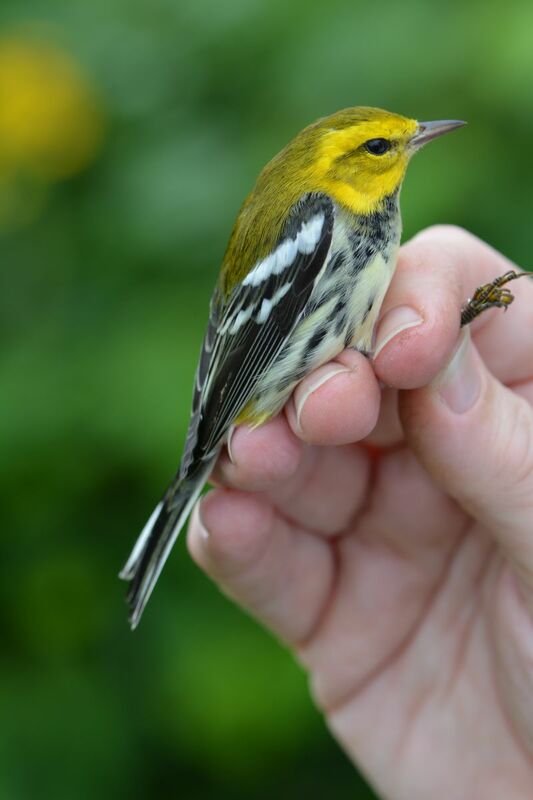 With the breeding season wrapping up and fall migration underway, the sound of the Black-Throated Green Warbler will soon be disappearing from the eastern forests for another winter. Yet there’s still time to possibly hear and certainly see these striking soloists as they migrate south in September. These smartly dressed birds can be seen in nearly any eastern deciduous habitat, from state parks to the maple tree in your backyard. Bird calls from The Macaulay Library at Cornell Lab of Ornithology recorded by Randolph S. Little, Geoffrey A. Keller and Wilbur L. Hershberger.